I can't tell you why, exactly, but I'm increasingly concerned that a drought may develop over the Central Plains this spring and into the summer. This is a "gut feeling" rather than something scientific. I'm passing it along for what it is worth. Of course! In fact, it isn't even close when comparing the movements' collective behavior to the Ten Warning Signs. See for yourself, here. 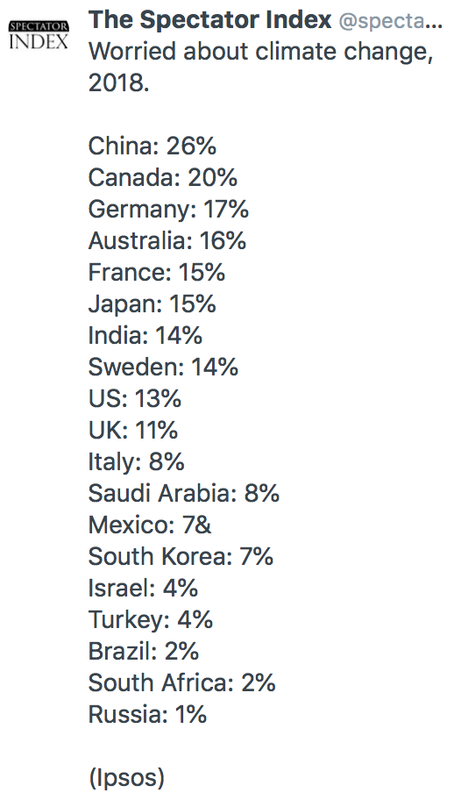 Fortunately, the vast majority of Americans realize the global warming issue for what it is. Via Twitter. Mindy and I wish you a joyous and grace-filled Easter 2019. Bonus: How today's MSM would have reported the events of Good Friday, Holy Saturday and Easter. As Michael Gurian explains in his book, The Minds of Boys, males are full of “boy energy,” an energy that “involves a lot of physical movement and manipulation of physical objects.” If channeled properly, this energy, although often annoying to teachers and mothers, helps boys to process, learn, and become innovators. Thus, a farm and the labor it offers becomes the perfect avenue for little boys to become independent and mature thinkers. It is surprising to me that some parents discourage their children from farming. It can be a great life. 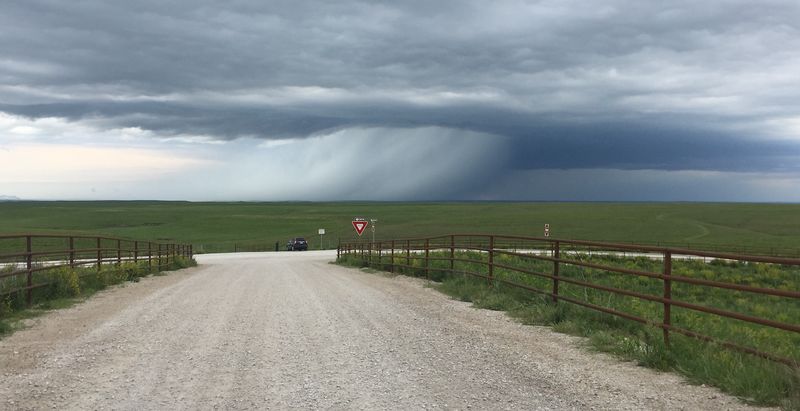 The view of the Kansas sky from a wide-open farm cleanses and inspires the soul. It is my goal to make people aware of serious threats due to weather even though meteorology is no longer the primary focus of this blog. 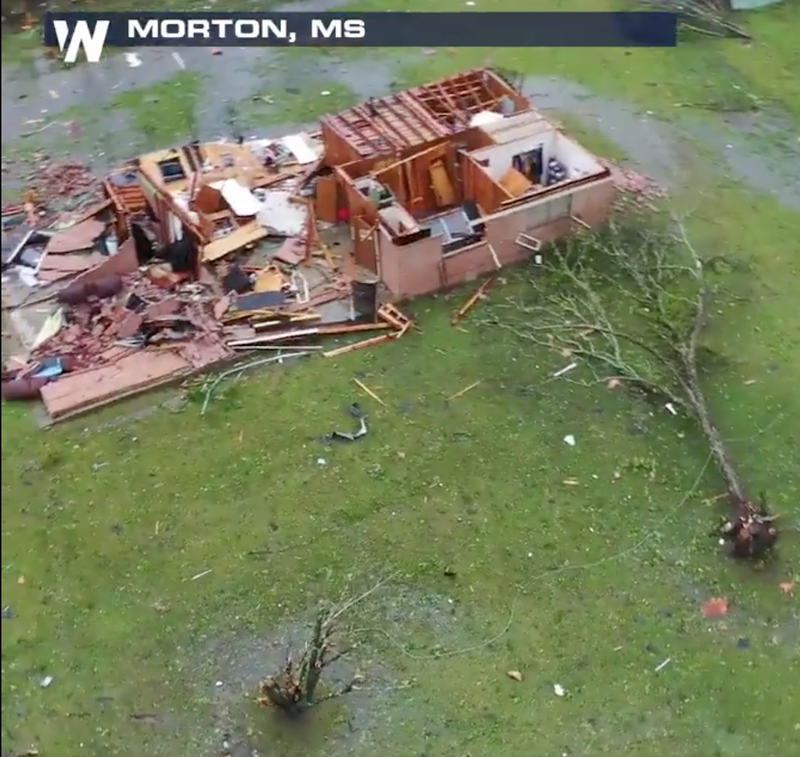 However, now that the Middle Atlantic and the Great Plains have had their first tornadoes of 2019, I am going to stop coverage of typical spring tornado situations. I will cover especially dangerous situations. 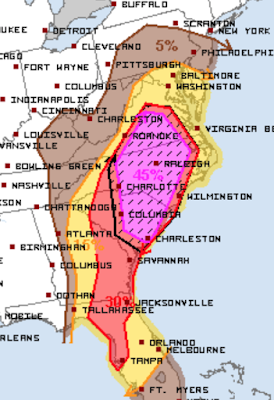 Heads up: Raleigh, Charlotte, Columbia, Richmond and Charleston. 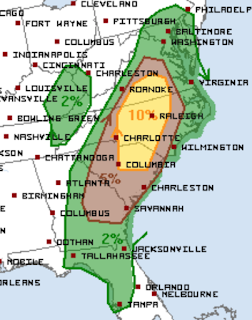 Damaging winds and tornadoes are in today's forecast. Let's break it down. The more serious risk is damaging thunderstorm winds. The significant risk is 15%. The purple area is a high risk of 45%. The hatched area is where wind gusts are forecast to exceed 75 mph! 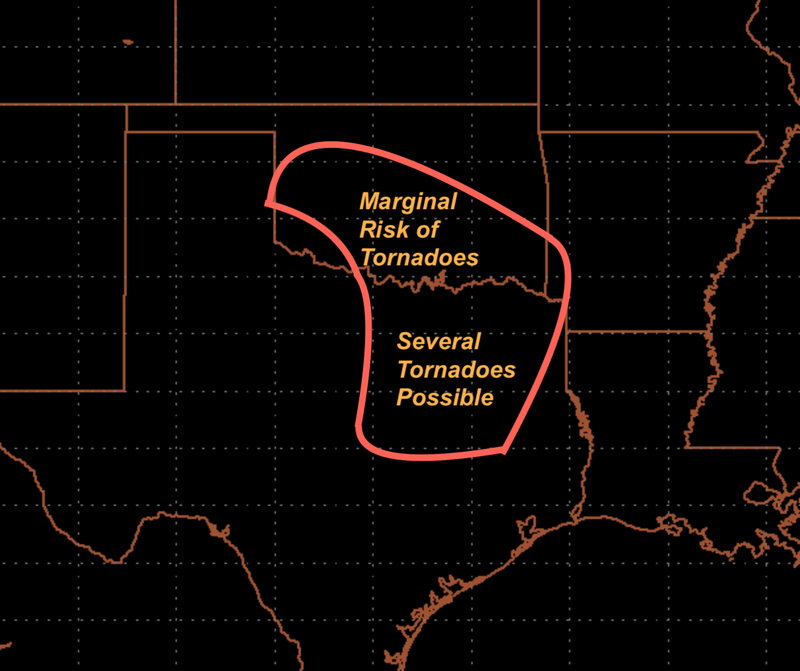 There is also an enhanced risk of tornadoes. On this forecast chart, 5% (brown) is the significant risk threshold. 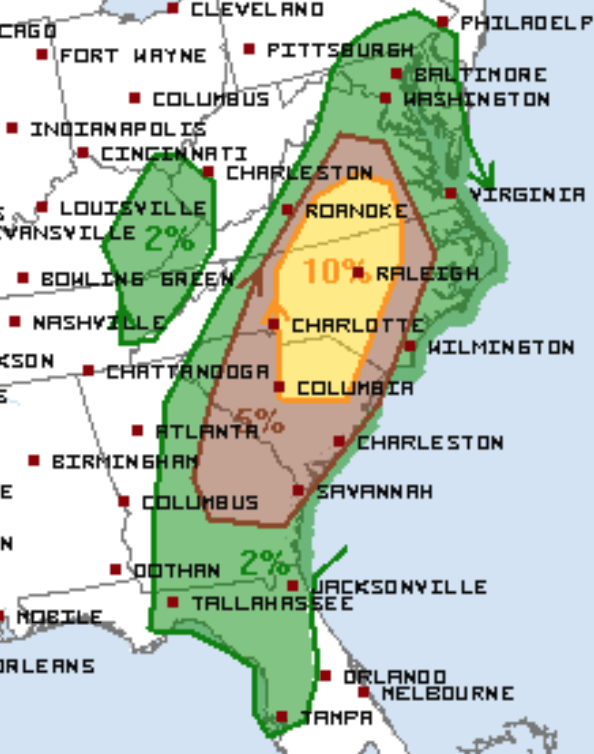 The 10% (yellow) is an enhanced risk. Power failures will be widespread. So, get some extra cash at the ATM and fill your car with fuel well before the storms arrive. If you have a chain saw, fill it as well. [Remember, if power is out, ATM's and fuel pumps will not work.] Power failures could last several days. Fully charge your phone and PC before the storms arrive. Take them off the charger before lightning is present. If warnings of extreme winds are issued, please shelter like you would a tornado. Preferably a basement under sturdy furniture. If not, a small room in the middle of the house. If a tornado watch or a "particularly dangerous situation" severe thunderstorm watch is issued, please exit your mobile home find other shelter, perhaps in a community shelter or other sturdy public building. Wherever you shelter, I recommend wearing shoes, taking a flashlight with good batteries, and a couple of bottles of water into your shelter. If appropriate, take diapers and portable family heirlooms like scrapbooks. Please make sure you have at least two independent ways of receiving the warnings! Good luck. 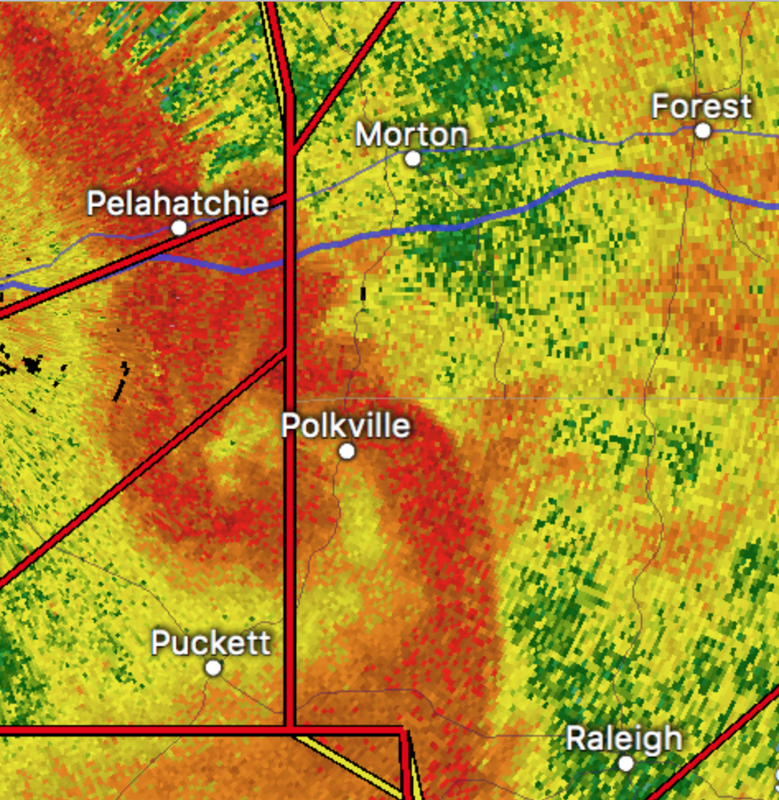 There is a major tornado research program pertaining to tornadoes in the Southeast. I would like to offer a suggestion for some serious research. I have been viewing weather radar on a virtually daily basis for 48 years. 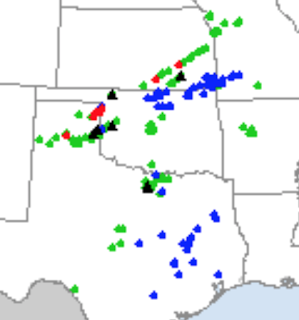 This afternoon, I saw a phenomena I've seen only one other time which was in the late 1970's in Kansas (I don't remember the date): a gigantic (as these things go) rotating mesoscale vortex that was not associated with a supercell thunderstorm that was apparently spawning multi-vortex, violent, tornadoes. 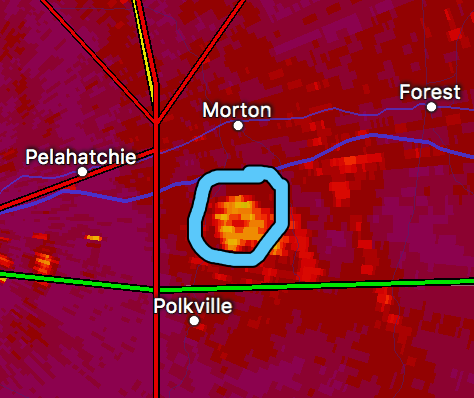 I'm bringing this to research meteorologists' attention because I have not seen any coverage of it in the Mississippi media, so far. Why is this important? The answer can be easily seen in a video here. A screen capture is below. 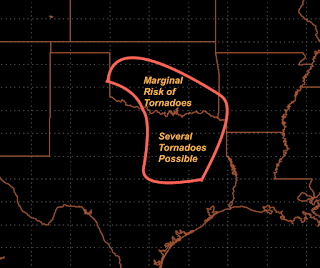 It is rare for non-supercells to cause tornadoes of EF-3 intensity which the above image suggests. 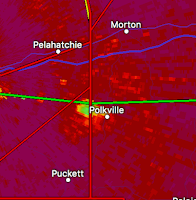 "donut" centered just west of Polkville, ten miles in diameter, is unusually large for this type of system. 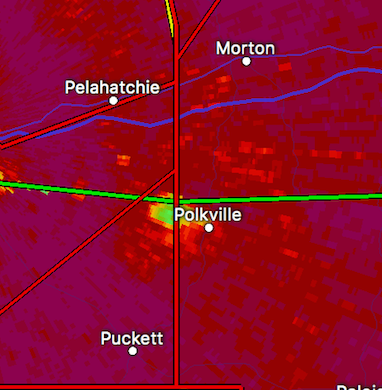 There was a report a few minutes later of a multi-vortex tornado near Polkville. 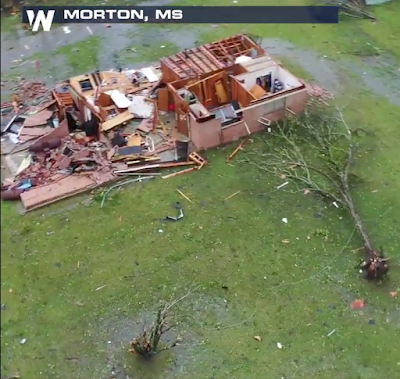 It is fairly common for tornadoes to loft debris. This image is commonplace. 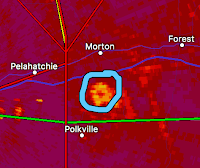 But, the image below, which appears to depict rotating debris aloft (it was Tilt 2) is unusual. This is just a little of what was unusual about this storm. Researchers? Have at it!! 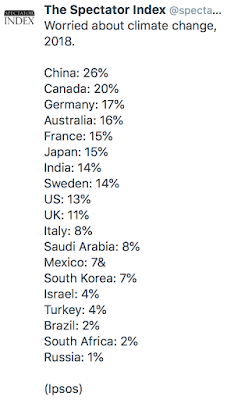 I was pleased to see this as part of my Twitter feed yesterday. 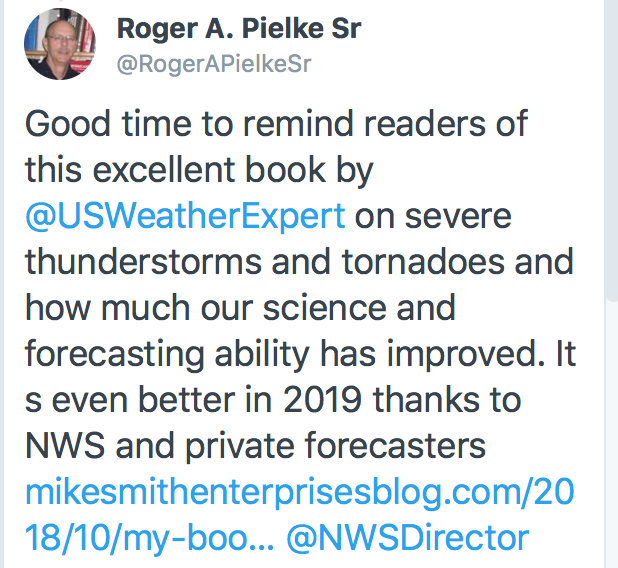 If you would like to check out my book Warnings: The True Story of How Science Tamed the Weather, click here. 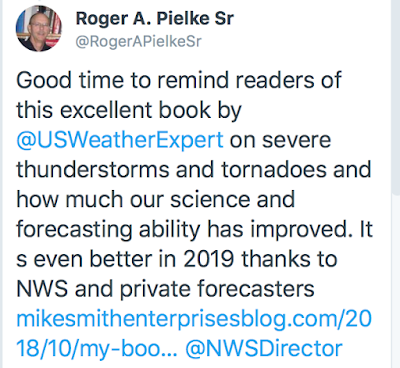 I validate all of my severe weather forecasts for my readers as a way of holding myself accountable. I'm happy to report that yesterday's was a real stinker. I use the word happy because tornadoes did not occur where forecast and fewer tornadoes are always a good thing. Below is the forecast posted here yesterday. 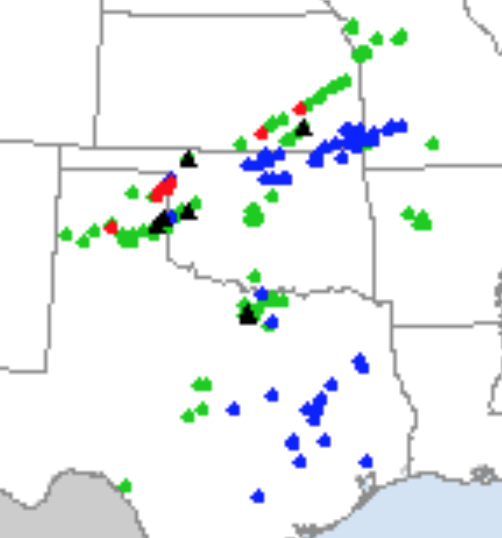 Below is the map of actual tornado reports (red dots = tornado). I take my forecasting seriously and I'll do my best to do better next time. The brown area (5%) is the significant tornado risk threshold. 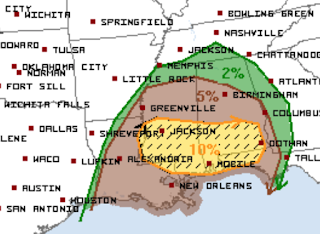 The yellow is an enhanced risk and the hatching indicates strong tornadoes are possible. This includes Jackson, Hattiesburg, Gulfport, Mobile, Montgomery and Panama City. Please monitor the weather in these locations today.